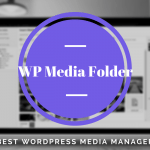 The default WordPress setup features file management for images and videos only. Rest of the files are not that supported. Today, you’re going to learn how to make those other files supported and how easy it is to run a website from where the end users can download files. WordPress looks simple at first glance, but it gets unmanageable with the growth of your website or blog. Files being part of everything, the management related to them gets tough. Right? Thanks to the third-party developers, there are solutions which can help the webmaster with the management of files and folders. One such solution (in WordPress’s realm, Plugin) is WP File Download plugin. In this detailed WP File Download review, I’ll be sharing my test results that will help you make a decision to buy it or look for alternatives. 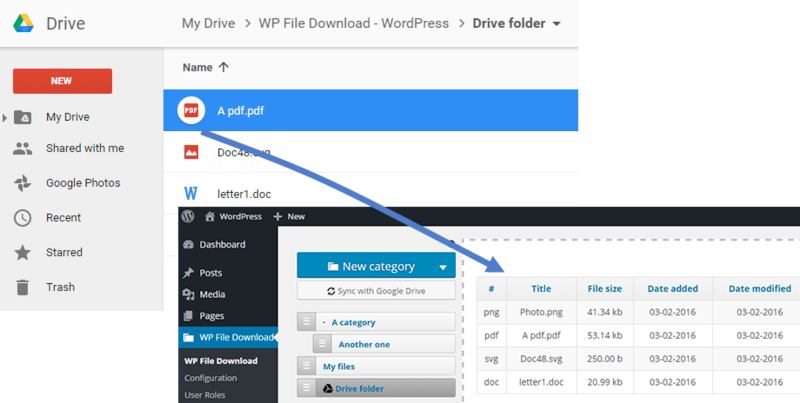 Why we need WP File Download plugin? As I’ve clarified this in the opening line itself, we need WP File Download plugin because the default setup only supports images and videos. For any other files, there is no built-in functionality to support their upload and download processes. Most importantly, there is no way you can manage them. For most of the WordPress users, it’s a tool to create and run a blog. However, that’s not the only thing possible to do. With the use of right plugins and codes, a WordPress setup can be used for almost, any purpose on the web. It can be used to run a complete flash featuring website, or a forum, or a social media network, or even a website featuring files to be downloaded. The WP File Download plugin provides features to support the last one in the list I just mentioned. Yes, with this plugin you can run a website from where the end-users can download files, and even upload them. The obvious now is that you can run a website where files and folders can be uploaded or downloaded. But, that’s just an abstract look of what all hidden inside. The buttons shown to the end users, like Download or Upload, can be customised to match with the overall theme look. You can go into the section and pick a color and configuration. The advanced tools available for file management are the core features. One can put files into folders or divide them into categories. There are filters available which can easily sort out the available files. One can even put those file into Public or Private mode with a single click. The management part is the superpower here and the related tools are all labeled. So, you will find it all simple to navigate. It’s the most iconic feature of this file management tool. A file or even a folder can be uploaded by dragging from the computer and dropping inside the browser frame. It cannot get better than this! A single tool that can be used to import a number of files in a single swing. Or, it can be used to import a single file too. With the availability of Drag & Drop uploader, File Importer doesn’t look that important, but it’s still there if you need. The section where you’ll find reports related to the number of files downloaded with ever related details. These statistics can be configured with Google Analytics too! Addition to these user-centric features, there are a bunch of management related features available too. With this plugin in action, the webmaster can quickly upload a file, download a file, and keep them in proper stacks. There is always a record of everything happening inside and the data is easily accessible. Different folders can be created with a few clicks and then the files can be dragged and dropped inside to make everything looks arranged. There is a Search tool which comes handy when you forget about the management scheme you applied and looking for a file to appear instantly. The files and folders can be locked for particular user profiles and thus, a proper management scheme can be implemented. Even the files can be made Private or Public, according to their status. A Private file can only be accessed with a registered account. On top of these all, the plugin is easy to use, and the interface is unique and very close to how WordPress looks and behaves. A proper documentation is shipped with the product to help the webmaster to quickly learn everything and get started to put applications in the motion. The developers behind have ensured that the plugin works perfectly with other plugins and even theme builders. Divi, Beaver, Site Origine, Themify, and few other theme builders are supported and the plugin stays 100% compatible with each of these. Google Analytics is also in the compatibility list, ensuring that the file tracking and reporting can be done within Google Analytics. This particular feature is really handy, considering the fact that most of us are using this tool. On top of these all, the plugin is compatible to work with almost every well-coded WordPress theme. In short, the plugin can work in every environment. Other than these pre-installed add-ons, there are a few which can be installed when in need. It adds support for the Google Drive and the integration helps with the two-way synchronisation and upload and download of files and folders. 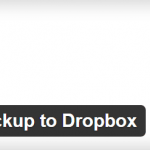 This is the same add-on as of above one, but instead of Google Drive, it works with the Dropbox, which is another popular cloud storage provider. With this add-on, the webmaster can implement a functionality that right after a file is download, a set of social sharing tools appears, asking the users to quickly share about their recent action on popular social platforms. It can boost the social traffic, for sure! 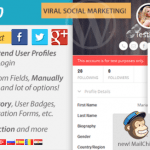 How to Use WP File Download plugin? Step 1 – Go to the JoomUnited official website and download the plugin after making the purchase. Step 2 – Once the installation file is downloaded and ready for the Desktop, login to the Dashboard area of WordPress website. Step 3 – Go to Plugins section and click on Add New button. 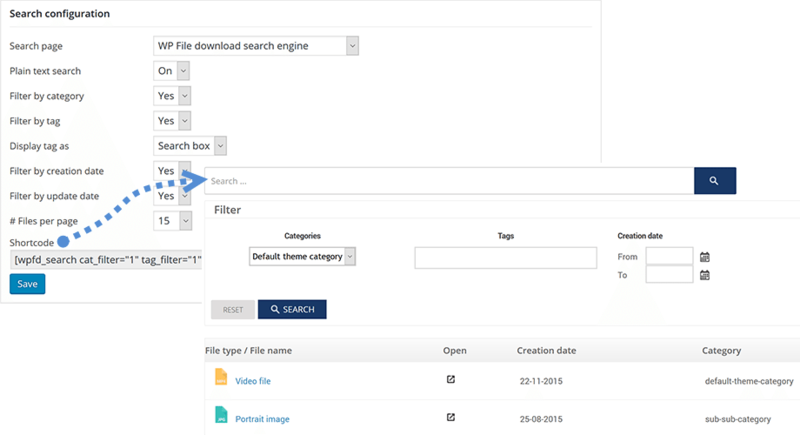 Step 4 – Click on the Upload Plugin button and hit the choose file link. Select the plugin file from Desktop and proceed ahead. Step 5 – The plugin will be installed and you need to hit the Activate button. Step 6 – A new set of tools will appear in the navigation area. 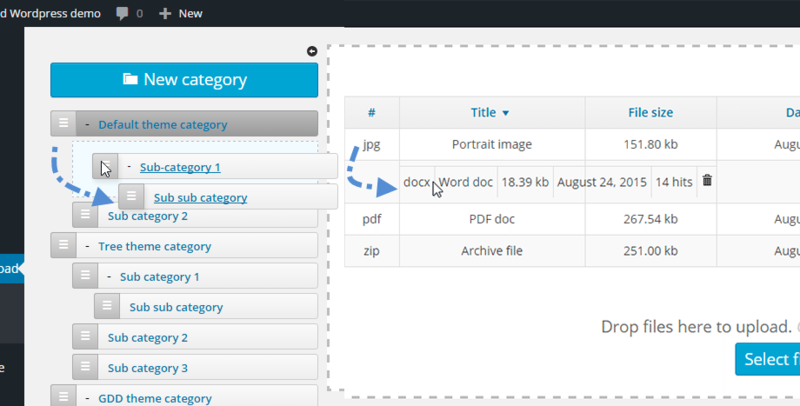 Hit the related link and the WP File Download plugin’s configuration page will be available to you. Start uploading files and create the folders to get started. It’s easy! 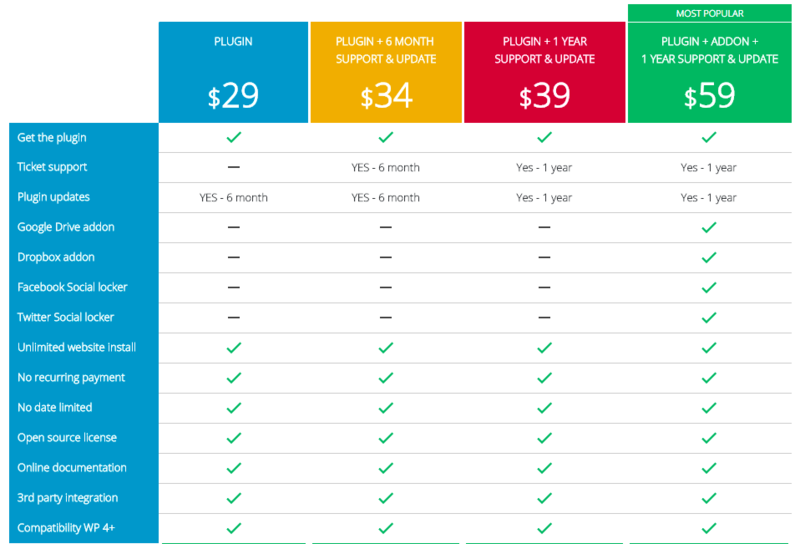 To get the plugin with all add-ons, you’ve to pay $59, but other than this, there are three different plans. The difference in pricing of those three varies with how long you need the support to be available. To be frank, I’m impressed that the pricing table is keeping most of the features available in all four plans. The plugin is easy to use, once you’re habitual of everything presented inside. The file management and the structure part are SEO friendly, keeping the URL easy to remember for both users and search engine bots. It has customization options which allow the webmaster to change the look and make it match with the theme itself. The drag & drop interface makes the uploading and management part look easy and smooth. Files can be dragged and dropped into categories (folders). 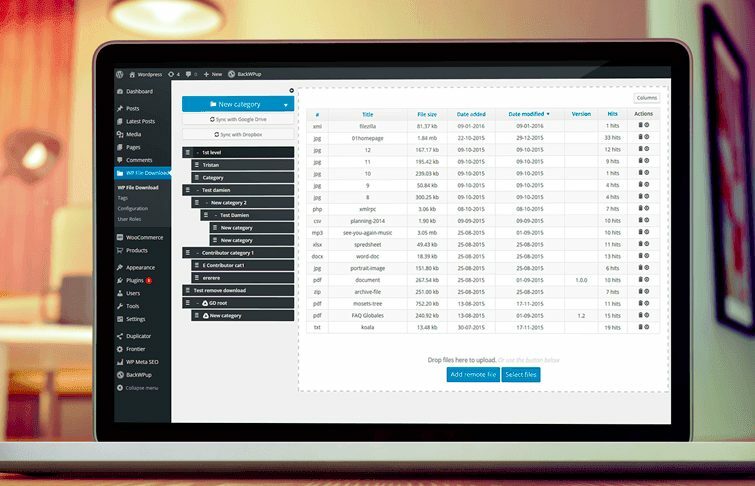 Stats of file download and upload are maintained which helps the webmaster to keep a record of everything and analyse the progress later. It can be little tricky to understand if you’re skipping the documentation for initial help. For those who are familiar with popular FTP solutions, WP File Download can be a new thing to learn. The conclusion part of this review is that, if you’re looking to start a website where a lot of files will be offered to download, then WP File Download plugin should be your pick.